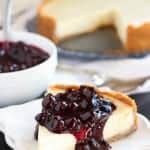 Greek Yogurt Cheesecake – Creamy cheesecake made with Greek yogurt and cream cheese in a graham cracker crust, topped with a juicy blueberry sauce. Who loves cheesecake? I’ve shared a cheesecake parfait and a cheesecake dip, but this is the first actual cheesecake recipe I’ve posted. For me, cheesecake tends to be sooo heavy. In an effort to lighten it up just a touch, I swapped out some of the cream cheese for Greek yogurt. 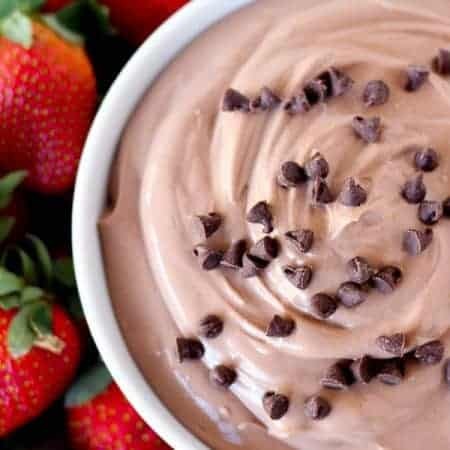 The Greek yogurt makes it super smooth and creamy, and it adds a little tang. The addition of yogurt lightens this up slightly, but not so much that it tastes like a “diet” dessert. 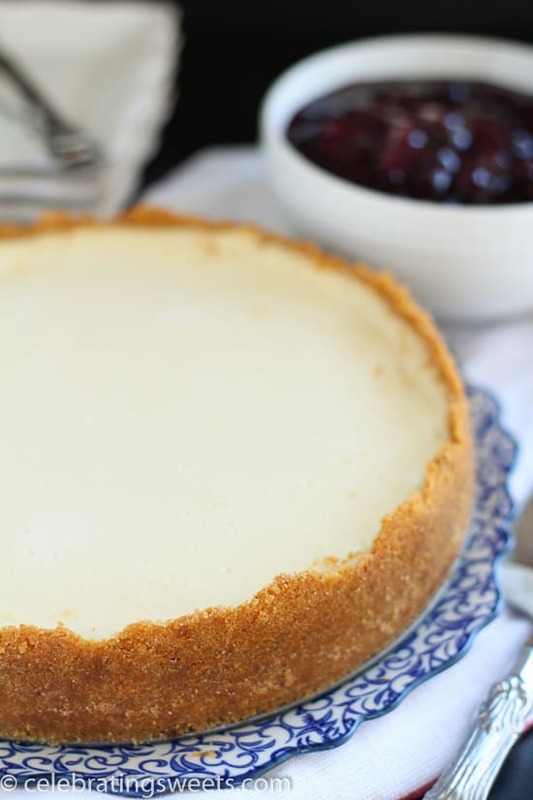 I served this cheesecake when we had family over for dinner, and everyone loved it. The crust is a traditional graham cracker crust; it’s buttery, sweet, and a little crumbly. 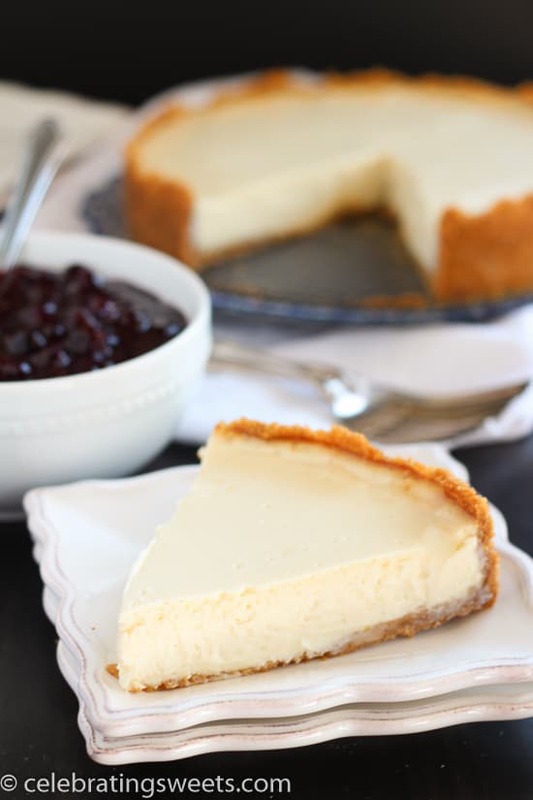 The cheesecake filling is unbelievably easy – just throw all the ingredients in a food processor, give it a whirl, pour it into the crust, and bake! 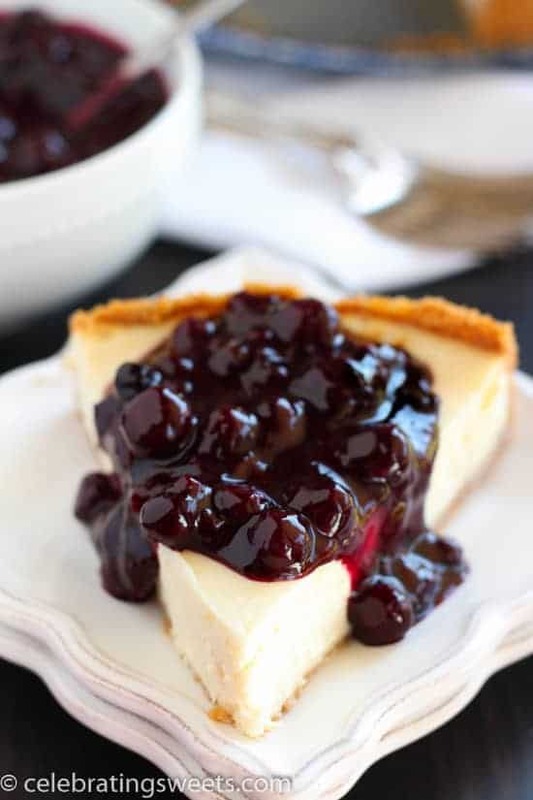 The cheesecake has a very slight lemon flavor, which is delicious when paired with blueberry sauce. You can top this cheesecake with your favorite fruit topping. Blueberries are our favorite cheesecake topping, and this blueberry sauce is the absolute best. It’s bursting with blueberry flavor, and it’s the perfect compliment to the creamy cheesecake. This recipe has quickly become my new favorite cheesecake. I’ll be making it again and again, and I hope you will too! 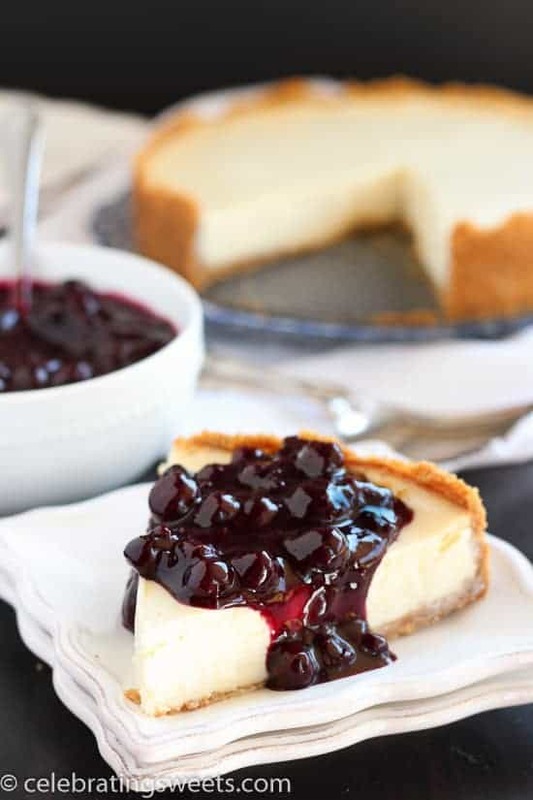 Creamy, sweet, and tangy cheesecake made with Greek yogurt and cream cheese in a graham cracker crust, topped with a juicy blueberry sauce. Wrap foil around the outside of a springform pan. Preheat oven to 325°F. In a large bowl, thoroughly combine graham cracker crumbs, sugar, melted butter, and salt. Pour the mixture into the prepared springform pan, pressing the mixture onto the bottom, and at least 1-inch up the sides. I like to use the bottom of a measuring cup to help firmly press the mixture in. Transfer the crust to the freezer while you prepare the filling. In a food processor, combine yogurt, cream cheese, eggs, sugar, flour, vanilla, and lemon zest. Process until creamy and completely smooth. Pour the batter into the crust and smooth the top. Bake in the center of the oven for 45-50 minutes, until the cheesecake is just set. Place the pan on a wire rack to cool, then cover and refrigerate until completely chilled. Combine the orange juice, sugar, and cornstarch in a medium saucepan and bring to a boil, stirring occasionally. When the mixture is translucent and thickened, stir in the blueberries and simmer for 4 to 5 minutes, just until a few berries have burst but most are still whole. Stir in the lemon zest and lemon juice and cool. Transfer to the refrigerator to cool completely. 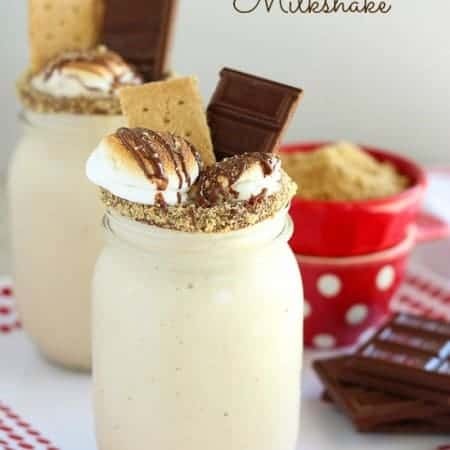 This looks quite delectable. I will definitely give it a try! Can’t wait to try this yummy cheesecake recipe. Juliette is adorable! That filling looks SO super creamy and delicious. 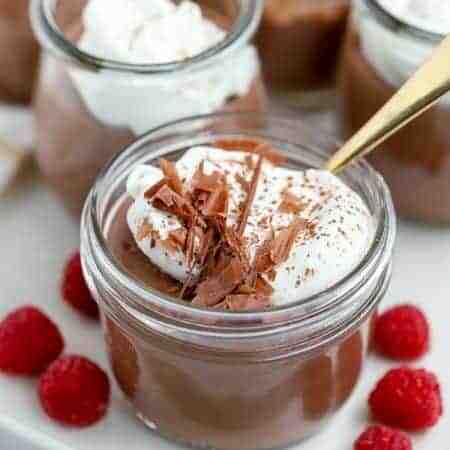 Love the compote too! Nothing beats a good cheesecake like this. Thanks, Thalia! I appreciate you stopping by! I loved this recipe!! Super easy to make and very appealing as it wasn’t heavy. We made ours as single cupcakes as well as a 8″. Now I can eat the dessert without the high calorie count. Do you happen to know how many calories this saves compare to not using the yogurt? Hi Amber. I’m so glad that you liked it! I do not have a calorie count, although you could enter the ingredients into a nutritional calculator to get an idea what this specific recipe contains. Thanks for stopping by! If i make mini ones how much time would i bake them for? It depends how small. If it’s in a standard size muffin tin, I recommend that you start checking them after 15 minutes in the oven. Enjoy!